My Legendary Style: What is Strobing and is it Replacing Contouring? What is Strobing and is it Replacing Contouring? We girls are always trying to find ways to enhance our beauty and the best way to do that is to learn as many makeup tips and tricks as we can. For so long contouring has been apart of so many people’s makeup routines but a new technique might be everyone’s new go to. That technique is called Strobing. Keep reading to find out what strobing is and how it compares to contouring. Strobing is basically using an illuminizer to highlight your face. The key places for the perfect strobing are where the light would naturally hit your face i.e. Cheekbones, brow bones, temples, down your nose, Cupid’s bow and chin. I would take it a step further and also highlight the inner corner of your eyes because... why not? I’ll admit contouring is an art form. If you do it just right it will give the illusion of a more chiseled face with model like features by using 2 foundations 1 in a shade lighter than your skin and the other in a shade darker and blending them seamlessly together. 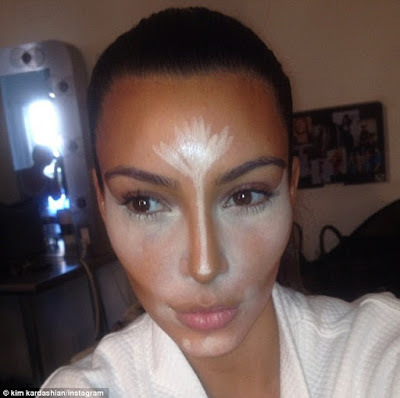 Contouring has been a makeup artists’ secret for a long time but it’s safe to say it was made famous by Kim Kardashian, makeup artist Scott Barnes and the Instagram pic seen round the world. She had girls of every walk of life trying to mimic her infamous look. Contouring gives a beautiful, defined look but can be time consuming and uses a lot of product, which can be suffocating for your pores. While strobing gives a more natural look and you only need 1 product it can be a nightmare for oily skin making it appear even oilier. So how do you decide to either contour or strobe your face? Both techniques are fun and have a real wow factor so it comes down to your personal preference and the overall look you’re going for. I suggest strobing during the day and enjoy the beautiful effect your skin gets when the light hits it and save contouring for a night out when you really want to turn some heads. If you’re stuck on how to do either one there are a ton of tutorials on YouTube to teach you how to achieve each look. Do you prefer to contour or is strobing your thing? Sound off in the comments below. I don't contour daily but, I can see the benefits of doing it if you are going out or having your photos taken. But, only under eye for daily looks for me.